The What Would Joe Mauer Do Wristband | That's Twins Baseball. A Minnesota Twins Blog. Have you ever had difficulty making an important decision and needed guidance? Have you ever reached a fork in the road and didn’t know what to do? Have you ever been down in an 0-2 count and couldn’t decide if the next pitch was a curveball or fastball? Have you ever witnessed “The Wave” coming at a sporting event and didn’t know if it was cool or not to participate (it’s not)? Well if so, ThatsTwinsBaseball has good news for you! 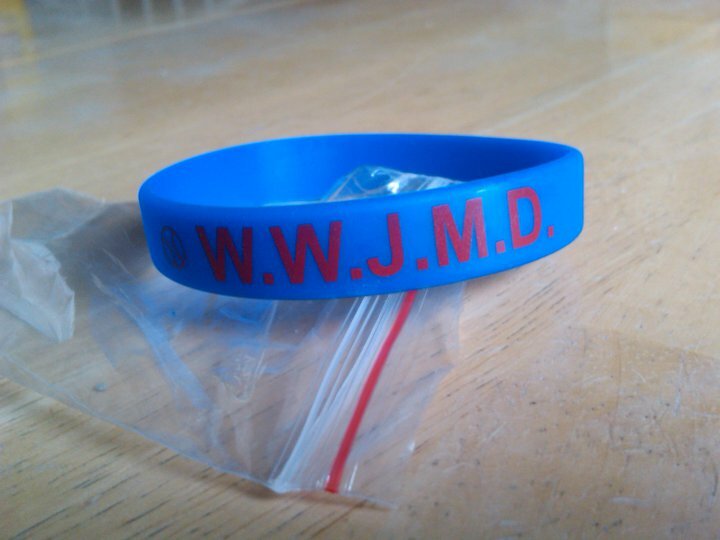 We are proud to introduce the new “What Would Joe Mauer Do” wristband! This is not a joke, this is as serious as Joe Nathan UCL tear. The image on the right is a photo of the actual wristband used by others to make key life choices, choices that you know will never be the wrong ones. All sizes are adult, your parents are adults right? Wouldn’t this make a great Mothers Day or Fathers Day gift? If you are interested in purchasing this life changing wristband don’t hesitate and call now while supplies last! Well, just kidding about the calling part, but in all seriousness if you want one let me know. Just fill out the form below with name address email ect. and in the message portion tell me how many you would like. Cost is $5 each with dollar shipping but will combine shipping on orders of more than one. I will contact you upon receiving your message to discuss payment options. Don’t wait until you made the wrong decision, make the right decision today and call now!